How do you install new cables from a tower site to local hard line cable plant without retrenching while simultaneously minimizing your expenses? With MaxCell. MaxCell Fabric Innerduct can vastly reduce the cost of placing new cables by overriding existing cables in occupied conduits and in most cases, eliminate the need for new conduits. From platform based cabinets, electronic sheds, or self contained newly installed field cabinets, MaxCell is the preferred solution for placing new cables in Cellular Backhaul applications. 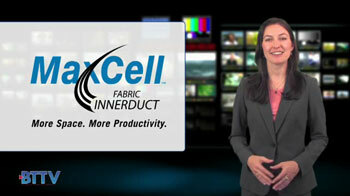 Maxcell, the innerduct solution for Cellular Backhaul.